It is imperative, more than ever, that Scotland, and the world as whole, actively works and innovates to safeguard the condition of our planet. 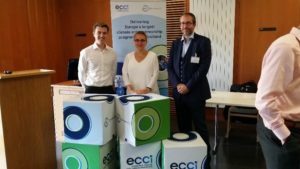 For this reason, the Ellis IP team were delighted to attend, and sponsor, the recent 2018 Climate Launch Pad Scottish Finals hosted by the Edinburgh Centre for Carbon Innovation. 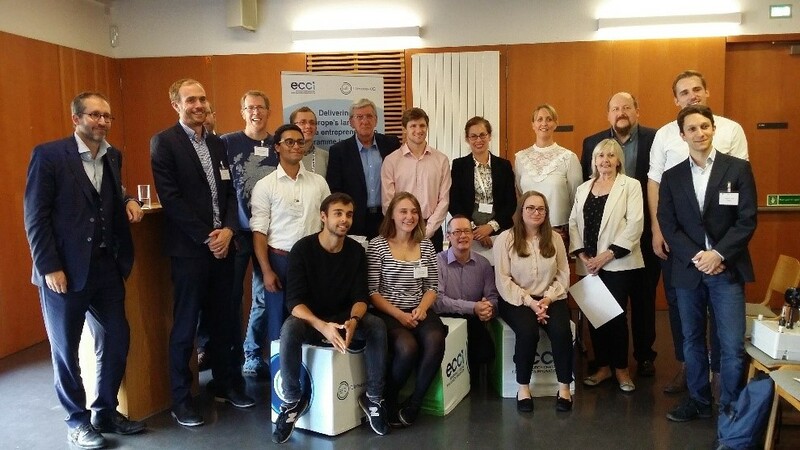 Eight exceptional cleantech business ideas were pitched by green-minded entrepreneurs to a panel of business professionals, including our own Dr Michael Ellis, founder and director of Ellis IP. Two keynote speakers kicked off the day, focusing on the immediate need for green initiatives in Scotland and explaining projects currently being implemented throughout the country. 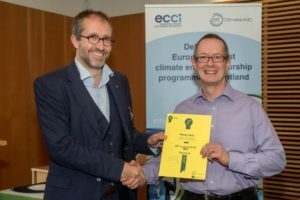 Paul Wheelhouse (MSP), Minister for Energy, Connectivity and the Islands, commended the work of Climate Launchpad and explained Scotland’s continuing need for green initiatives, which are fully supported by both himself and colleagues in Scottish Parliament. Iain Gulland, chief executive of Zero Waste Scotland, went on to explain how important it is to create a society where resources are valued, and where our waste is reduced, the organisations key vision. He also noted, from previous experience judging Climate Launchpad competitions, how difficult it is to choose three ideas, from the eight who excelled into the national final. Cleantech concepts pitched at this year’s competition included Sofa for Life, an innovative concept where a sofa can develop with you throughout your lifetime, and individual broken parts can easily be replaced, therefore negating the need to purchase a whole new sofa each time a change is required. Another business, Telesis, focused on harnessing the natural geological features of beaches to naturally filter water for desalination. By ensuring water is non-polluted, desalination can occur at half of the carbon cost compared to systems currently operational, which could be a game changer for small resource-limited nations such as Singapore. A range of further ideas were pitched before the judges left to toil over who would come in the top three – which I realised would be no easy feat after the audience began whispering who their favourites were! After an interesting networking lunch, and a final keynotes speech by Entrepreneurial Scotland’s Ken Whipp, the winners were announced. In a close third place, after much deliberation, came Undisturbed, who focuses on enabling ‘bathrooms for peaceful minds’. By replacing the industry standard of plastic for shower curtains with much more sustainable hemp, carbon usage is reduced. The product has further benefits, such as eliminating the hated shower curtain ‘cling’, and Undisturbed’s primary concept rolls the shower curtain away when not in use, for a more visually appealing bathroom. Second place went to Planet Heat, who have developed an innovative system which can be easily installed into any flowing water way within around 30 metres of a home. This unit serves to cycle water out of its source and extract 3 degrees of heat before releasing the water back into its source. This process provides enough energy to heat your home at little ongoing cost. Planet Heat had gone to great effort to calculate the size, and more importantly location, of their potential clients. After combining this with the knowledge of several fully-operational prototypes, and easy to access government-funded renewable-energy grants, the judges had confidence in the growth potential of the business concept. After an exceptional pitch, that ticked all the boxes, first place went to Crover, who provide a solution for a significant challenge in long-term grain storage. Lorenzo Conti, founder of Crover, went on to explain how above 20% of grain is lost in silo storage due to a range of unwanted conditions and pests, yet it remains extremely difficult to monitor grain while it is siloed. Crover have developed an autonomous probe that is deployed within the silo, by burying through the grain it can sense and instantly report all required variables to determine if any remediation action is required to safeguard the crop. Promising to deliver annual licenses at a fraction of the cost of crop-loss, this concept is likely to be a no-brainer for the farming and food industries. Needless-to-say, competition was tough, and Ellis IP urges everyone who pitched to continue to drive their ideas forward with vigour and confidence. Many congratulations to the three winners who will now go on to the Worldwide Grand Final, with 150 competitors from 50 geographies, which will also be hosted in Edinburgh this year. Good luck!